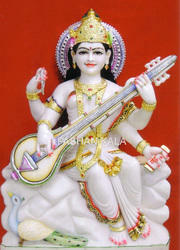 Our company deals with offering high quality assortment of Marble Saraswati Maa Statue. They are known among our client for their flawless cuts and finish. Saraswati Maa as a symbol of education these statue are used as both decorative and religious aspects in various educational institutions. Our clients can avail them at competitive price. • We can make sizes : 12, 15, 18, 21, 24, 27, 30, 33, 36, 39, 42, 45, 48, 51, 54, 57, 60, 63, 66" inches etc. Backed by year of experience in the domain of manufacturing and supplying, we are able to provide our clients a exquisite range of Saraswati Maa Idols. These Maa Saraswati Murti are widely known for its durability and lively appearance attributes. Moreover, the offered statues are developed utilizing quantitative material sourced from authentic and relevant vendors. In addition to this, the offered product is available in market leading rates. Being one of the prominent manufacturer, exporter, trader and supplier of different kinds of statues, we are affianced in providing an elegant range of Marble Saraswati Maa Statue On Lotus. Crafted with premium grade marble and hi-end tools, it is also quality tested on several parameters in relation to finish and design. The offered statues are extensively reckoned due to the attributes like long lasting shine, proper finishing, lively appearance and durability. Additionally, the offered statues can be also effectively customized as per clients’ specifications within stipulated time frame. 12, 15, 18, 21, 24, 27, 30, 33, 36, 39, 42, 45, 48, 51, 54, 57, 60, 63,66" inches height etc. • Payment mode : T/T (bank transfer), Western union, paypal by your credit card. We feel proud to introduce ourselves as trusted manufacturer, exporter and supplier of unrivaled quality range of Marble Saraswati Standing Statue. This statue is extensively acclaimed and appreciated for its excellent finish, lively appearance, captivating design and exquisite pattern. Our offered statue represents the beautiful craftsmanship and is designed from premium class marble. Additionally, this statue is available in varied sizes, designs and luminous colors at affordable prices. 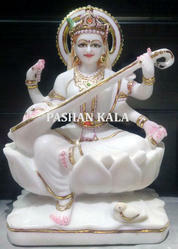 We are offering our client a unique collection of Saraswati Maa Statue, which are worshiped in home, temple, offices and various other place. Our expert artisans develop these Marble Saraswati by implementing latest method and make these statues perfect in finish. These are customized and packaged as per the specification of our client. We manufacture and export superior quality Marble Saraswati that are made as per industry standard. Available in several design and size to meet the varied requirement of temple. Our broad range of statue are mind blowing. Their smooth finishing adds a peaceful sensation to the surroundings. We deliver these Saraswati Marble Statue to our client in safe packing. Our clients can avail them at competitive price. 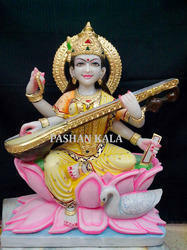 We offer Maa Saraswati which is made from quality marble stone. 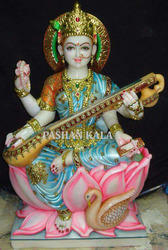 The Goddess Saraswati Statue is considered as a deity for knowledge. 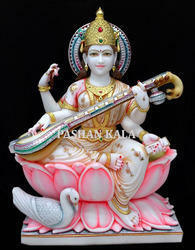 These Saraswati Statue have veena in one hand which symbolizes music; book in one which symbolizes knowledge. These have a swan carved out in left corner which is a vahan of the goddess. They are offered to the customer in reasonable price. 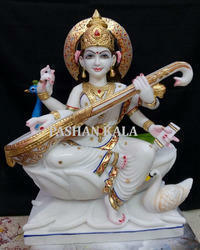 Looking for Marble Saraswati Maa Statue ?